Designed to hold up to four handguns and is also a great accessory case. 15 3/4" x 11 3/4" x 5 1/2" inner dim. 16 5/8" x 13 1/4" x 6" outer dim. Perfect for what I want. 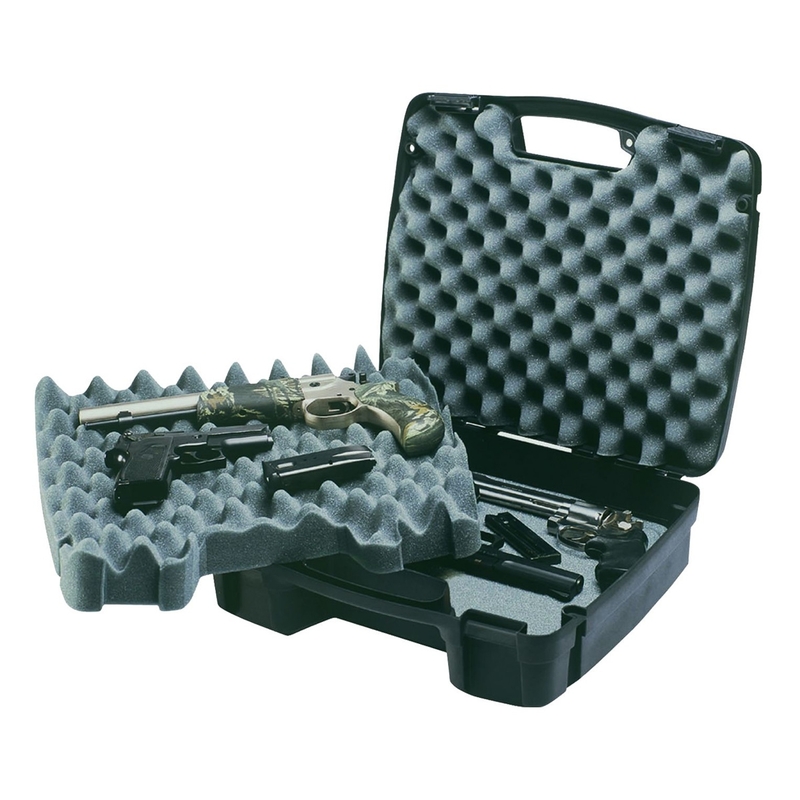 Very nice case which will take four air pistols with ease. Very pleased. First impression of this case is of a scaled-up version of the single pistol case. Whereas the two halves of the small case are symetrical, the large version has its carry handle offset to one side, so it's easy to see which way up the case is resting. The other external difference is the addition of a third moulded grommet, which would allow the case to be locked with a seperate padlock across the handle. Internally, there are four layers of foam. The top two close together in an eggshell pattern, while the bottom layers are smooth. I was quite sceptical that the bottom layers would hold contents in place, but they do so very effectively. Because all four layers are removable, instruction manuals and other paperwork can be stored under the outer layers. I use the lower, flat foam layer to store pellets, CO2 bulbs, magazines, spare parts and tools. The top layer will easily accomodate a 92 FS size automatic with a silencer, plus two small frame automatics (PPK size). just got this for my webley typhoon and daisy 722 airpistols and its excellent plus will still have room for another 2 pistols. amazing service from uttings, delivery was very speedy. top class service, many thanks.